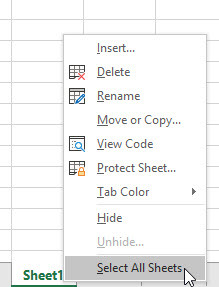 Right click one of the sheet tabs and choose Select All sheets (this is called grouping the sheets). The warning is NEVER EVER save a file when the sheets are grouped. NEVER!. When sheets are grouped whatever you do to one sheet is done to all the grouped (selected) sheets. This can be effective for editing all the sheets at once if all the sheets are identically structured, but it is extremely dangerous when they aren’t. 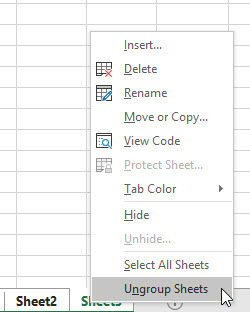 If you save the file when sheets are grouped they will still be grouped when the file is next opened and someone may not realise the sheets are grouped and make a change that impacts all the sheets. You have been warned.